The border crossing between Namibia and Botswana at Ngoma was quick and easy; we had to disinfect the car for foot and mouth disease but it was far easier than the hassle we had doing a similar thing in Kinshasa. We all got out and wiped our feet on a disinfected mat then drove Mitzi through a disinfectant dip and the process was complete. 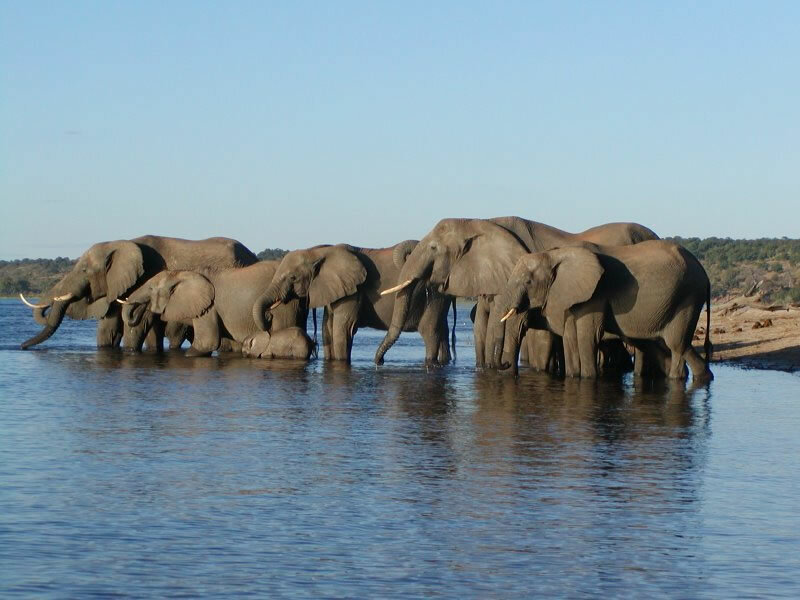 Next stop was Kasane on the Chobe River and we treated ourselves to a couple of twin-bedded chalets at the Toro lodge, a reward after our camping experiences in Nambwa; we enjoyed a great buffet evening meal and an early bed. We booked a boat trip for the afternoon so the morning saw us re-stocking the food boxes at the local Spar, catching up on a bit of washing, a picnic lunch and then off to the river. The boat trip was something very special; 3 hours and we saw lots of birdlife, elephants swimming, hippos, crocs, water buffalo, monitor lizards,even a rare Puku drinking at the river bank and a truly African sunset on the way back. We booked an early morning game drive the next day but after getting up at 5.30am and waiting for half an hour in the cold, for the driver and guide to arrive, we decided that it wasn't going to happen and went back to bed. We were now so near to Victoria Falls in Zimbabwe that we decided to head even further East and so set off for yet another border crossing. Now for Zimbabwe (We return to Botswana report, on this page, after our visit to Zimbabwe. The border crossing back from Zimbabwe into Botswana was simple so we motored on to Francistown for a great lunch at Barbara's Bistro and to get fresh supplies, ready for our forays into the Makgadikgadi Salt Pans and then the Okavango Delta. We were most surprised to find Francistown to be a really big, busy town, bustling with people and with a very prosperous ambience. Re-supplied we headed for Nata, staying the night in the local Maya guest house which, though noisy, served its purpose as a springboard for our visit to the Salt Pans the next day. The Makgadikgadi Salt Pans is a vast area, which is dry for most of the year and home to a variety of animals and especially birds; the Pans happened to be full of water when we visited - the most for 20 years. We visited the Sowa Pan via the Bird Sanctuary and spent time at their hide viewing flocks of Pelicans, Flamingoes, Stilts, Avocets etc. We moved on to Meno a Kwena Lodge - tooth of the crocodile, (managed by Dave Dugmore) which had been recommended to us by Emiliano, a friendly tour guide we had met in Etosha, Namibia. We had been unable to make phone contact and on arrival at 5.00pm we found ourselves barred from entry by a 9,000 volt National Park perimeter fence! 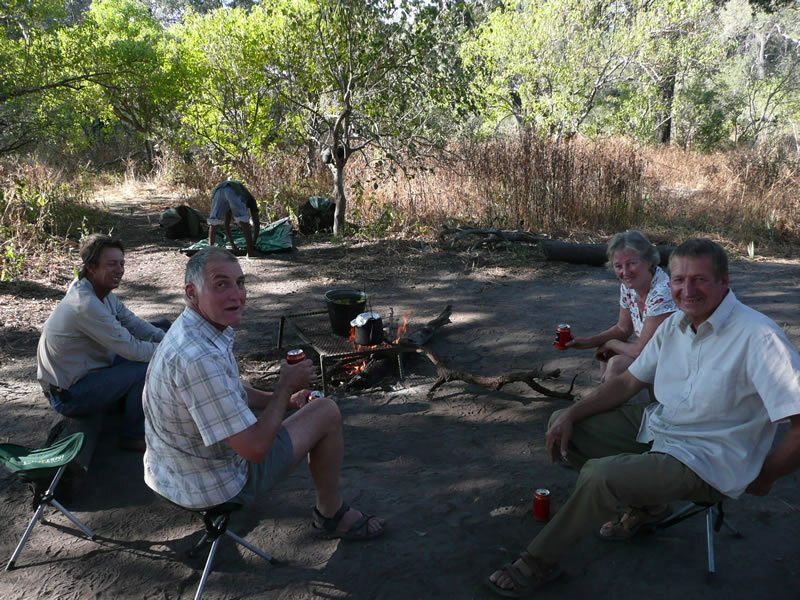 We were just about to set up camp outside the fence when a vehicle turned up and let us through; Dave kindly agreed to let us camp (the Lodge was full) in the grounds of his spectacularly situated and exclusive Lodge overlooking the Boteti River. We had an ideal site and an unforgettable evening, thanks to the close attention of a lion creeping around our camp bellowing out an incredibly loud and resonant roar for much of the night - night time visits to the loo were definitely cancelled on this occasion! Now we have heard lion but still not seen them. 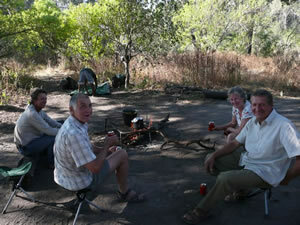 Next stop was the Old Bridge Backpackers Lodge at Maun where we occupied a couple of well appointed fixed tents (B & J had the Honeymoon Suite!) 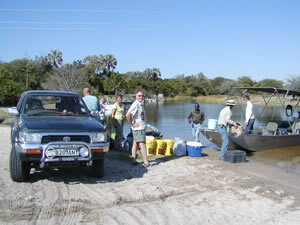 for a couple of nights before setting off for a 3 day river trip up the famous Okavango Delta. We packed our own camping gear into a capacious, powerful, shaded, aluminium boat before venturing around 150 km into the huge Delta and setting up camp on a sub-island of Chief's Island. The Delta was amazing, a vast expanse of reeds and islands dissected by a myriad of water channels edged with water lilies and fed by the rains in far away Angola; the water was at its highest for 20 years and still rising! 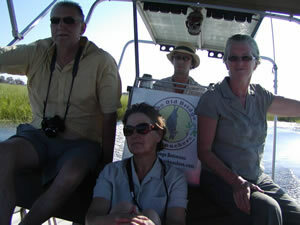 Thanks to our pilot Martin and KK our guide, we saw:- Fish Eagles, African Jacanas, Pied Kingfishers, Pel's Fishing Owl etc, as well as Zebra,Hippo, Crocodiles, Elephant, Kudu, Giraffe, Impala, Red Lechwe, monkeys, both from the river and on our island walking safari. We cooked over an open wood fire, had warm water bucket showers and our alfresco 'Thunderbox' (toilet) was a loo seat on legs perched over a hole in the ground with the most amazing view across the island. The Okavango sunsets were classic and the starlit nights filled with the sounds of hippo, hyena, frogs and a plethora of bird calls. 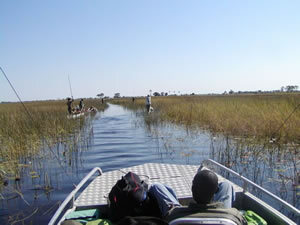 We had the opportunity to swim from the boat, in the beautifully clear water of the Okavango (whilst our guides assured us there were no crocs or hippos about). On our return trip we were all given the opportunity to take the helm and pilot the boat (at some speed) through the narrow twisty channels of the Delta - an exhilarating experience for us all. We had a memorable visit to the Okavango and we would certainly recommend it and the Old Bridge Backpackers Lodge as a great value for money jumping off point. A 600 km drive to Windhoek (Namibia) next.